In 1973-74, I had the good fortune of reading the autobiography of Mohammedali Currim Chagla (1900-1981) titled Roses in December which is one of the truly great autobiographies written by eminent Indians. Born in 1900 in Bombay, he became an eminent lawyer. He was appointed as Professor of law to Government Law College, Bombay in 1927. He worked for Mohammed Ali Jinnah as his secretary and the Muslim League before it became a separatist party. In 1928, the Congress asked Motilal Nehru to write a draft Constitution for India as a riposte to the Simon Commission Report. The Nehru Report spoke in terms of a secular India, a vision that was rejected by Jinnah. A disillusioned Chagla then left Jinnah for good. 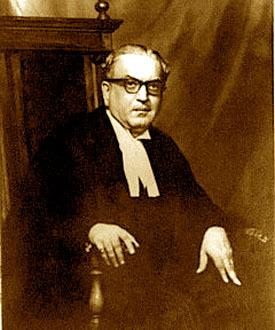 M C Chagla was appointed as a judge of Bombay High Court in 1941. After independence, Mahommedali Currim Chagla (M C Chagla) was elevated as Chief Justice of Bombay High Court in 1948 and held that post with great distinction till 1958. Later, he became Ambassador to the USA, Mexico, Cuba, Vice-Chancellor, University of Bombay, High Commissioner to England, Minister of Education (UGC pay scales etc. were his creation) and so on. The mute millions of India should compare and contrast this approach of M C Chagla with that of his successor today, I mean HRD (Human Resource Destruction!) Minister Arjun Singh who is known for his Himalayan wisdom and who decided last year that the best way of safeguarding Aligarh Muslim University's minority status is by reserving 50 per cent of the seats for Muslims. It is reported that this decision was taken unilaterally, without consulting anyone else in the Cabinet. His fellow Ministers chose to remain notably silent. Only the Left Front, which supports the Ministry from outside, came out openly against this move of Arjun Singh. There is a general belief that the move was taken by Arjun Singh, upon the secret dicta of Sonia Gandhi and silently abetted by Dr. Manmohan Singh, in a bid to woo Muslim votes for the Congress in the ensuing elections to the UP Assembly next year. Sonia Gandhi, Dr.Manmohan Singh, Arjun Singh, Shivraj Patil, Antulay, Ram Vilas Paswan and other known Global Tekhedars (contractors) of Pan-Pseudo-Secularism would be shocked to sudden cultural death by the following words of Chagla addressed to delegates to the first plenary session of the Bharatiya Janata Party at Samata Nagar, Bandra Reclamation, Bombay, on 29 December, 1980. 'The British believed in communalism in order to keep the Hindus and the Muslims apart so that they could govern the country for all time to come. Smt. Indira Gandhi violated the spirit of the Indian Constitution with impunity by imposing a National Emergency on the midnight of 25 June, 1975, on the ground that a threat was posed to the internal security of the country. The real cause was the threat to her position as Prime Minister following the Allahabad High Court judgement when on 25 June, 1975, the Supreme Court, while admitting her appeal in the election petition against the Allahabad High Court judgement, granted a partial stay. Indira Gandhi's propensity to act like a Hitler or Stalin was exhibited by her in 1973 itself when she superseded three senior judges of the Supreme Court, particularly Justice Hegde, Justice Khanna and Justice Shelat and appointed Justice A N Ray as the Chief Justice of India. There was a countrywide protest against his appointment. At a public meeting held at Sunderbhai Hall, Mumbai in 1973, Justice M C Chagla spoke strongly against the blatant political interference of Indira Gandhi in the functioning of the judiciary at the highest level. This meeting was also addressed by former Chief Justice Shah and Palkhiwallah, both of whom fully endorsed the principled stand taken by Justice M C Chagla on this vital national issue. The real test came when the Emergency was declared in 1975 and in the fight against Emergency, the contribution made by Justice M C Chagla is indeed unforgettable till today. Arun Sathe, a noted BJP lawyer and one of the top leaders of the BJP has paid this tribute to M C Chagla: 'M C Chagla was really a gem of a person. For a right cause, he never hesitated in participating and in taking upon himself certain responsibilities. When I recall the selfless public services of Chagla, I consider myself blessed by God that I had the privilege of being associated with him. I remember that immediately on imposition of Emergency in June 1975, I went to his residence. Many eminent lawyers including Ram Jethmalani were present there. When I requested Chagla to appear in the Bangalore High Court in a habeas corpus petition of Atal Behari Vajpayee and L K Advani, he readily agreed and went to Bangalore. The rest is history. 'The history of the Emergency cannot be completed without extolling the services rendered by the late Justice M C Chagla, late Justice J C Shah and the late N A Palkhiwala. In the 32nd anniversary year of the Emergency, I salute these three legendary figures who worked and fought for civil liberty, individual freedom and political democracy in India. In 1980, just one day prior to the first All India session of the BJP, an All India Lawyers' Conference was held in Mumbai under the Presidentship of Ram Jethmalani who was then the vice-president of BJP. The said conference was addressed by Justice Chagla, Justice J C Shah, Justice Soli Sorabji, lawyer Shanti Bhushan and many others. When Arun Sathe requested Justice Chagla to attend the BJP session next, he readily agreed and his historic speech at that session is now a part of the history of BJP. Justice M C Chagla addressed the delegates to the first plenary session of the Bharatiya Janata Party at Samata Nagar, Bandra Reclamation, Bombay, on 29 December, 1980. Here are a few brilliant excerpts from Justice Chagla's great speech on that occasion: 'I am not a member of the party and I am not addressing you as a delegate. Still I assure you that when I am talking to you I do not feel like an outsider. I honestly and sincerely feel that I am one of you. This is because all of you have come here for a cause that is as dear to me as it is to you. This huge gathering that I see before me is Bombay's answer to Indira Gandhi. This gathering tells her plainly that those gathered here are opposed to her authoritarian methods and her intention of becoming a dictator. These people are here to fight for the cause of democracy. They are here to tell her that the country is in a terrible state, that there is chaos, mismanagement and corruption everywhere. We are not being ruled by the rule of law but by a group of opportunists, hypocrites and sycophants. What is amazing is that Justice Chagla showed tremendous foresight in observing as early as 1980 that only the BJP was capable of serving as an alternative to the Congress Party. He was proved right in 1999 when Vajpayee became the Prime Minister of India. Finally he was a great champion of the Uniform Civil Code for Muslims. The need of the hour is to de-politicize all the Muslim issues, which are detrimental to national integration. For this, an aggressive but meaningful campaign as part of a larger project aiming at creating a critical class within the Muslim society is to be evolved by the Muslim intellectuals by a scientific and modern interpretation of Islamic scriptures. Let the Muslim Personal Law be the starting point. Justice Chagla loved life. He was alive to the best in life. Solid character was the bedrock of his greatness. He sought excellence in every field of his endeavour. Gentleness was the most important aspect of his greatness. I can sum up his message to all of us in these words: 'It is great to have a free mind. Break down the walls of prejudice, fear and limitations. Have the courage to think your own thoughts, speak your own mind and live your own life. Keep yourself open to the power of the infinite. As a huge dam converts the power of a mighty river to create electricity and put it to work, so you can convert the golden river of God's goodness into spiritual electricity to help light the world. Life of Justice M.C.Chagla is an inspiration to younger people,I have met Justice Chagla in 1959 in U.S.A. and again in 1964 in Chandigarh.I really feel very lucky and proud to meet such a noble and great personality in my life face to face. Late CJI Sri. V. R. Krishna Iyer is believed to have said 'Supreme court decisions are final, but NOT Infallible'; When a highly respected person in Indian Judiciary has such a comment, it must mean a lot for the present day system, where judges are getting caught red-handed for taking Bribe. Fortunately eminent persons like VRK and MCC are not alive today to see what is forbidden, even under law! I really feel proud that our country has produced a son like M C Chagla.